Take off your shoes and BLAST your upper and lower body, empower your trunk, abdominals, and back muscles for a lean and strong center. This is core conditioning at its best, emphasizing balancing and focusing on the development of a strong core. The core is the link between the lower and upper body. The core, comprised of multiple muscle groups including the abdominal and low back muscles, diaphragm, pelvic floor muscles, latissimus dorsi, hip flexors and the gluteal muscles transfers forces and power between the lower body and the upper body. For optimal performance the core needs to be solid, to avoid energy leaks within the kinetic chain. Our core conditioning class is designed to help you build a solid core. Furthermore, a strong core helps keep your back healthy, maintain good posture, improve your balance, enhance performance and prevent injuries. Core conditioning is increasing in popularity, because it is a component of a larger movement toward “functional fitness.” Functional fitness simulates ordinary movements you do at home or work to train your muscles to work together in preparation of complete everyday tasks. Training your core emphasizes strengthening and stretching the muscles of the abdominal, pelvic, and lower-back regions. 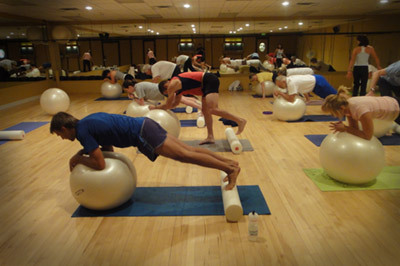 Therefore, core training is helpful in sustaining the ability to perform the activities in daily living. Taught throughout the week, our core conditioning class that utilizes fitness balls (or sometimes called stability balls) are also becoming a hugely popular!